Claim 3/1 Germany to beat San Marino at Paddy Power, instead of 1/100! What a gift! Paddy Power are offering BetAndSkill customers the chance to back Germany to beat San Marino @ 3/1, instead of 1/100! 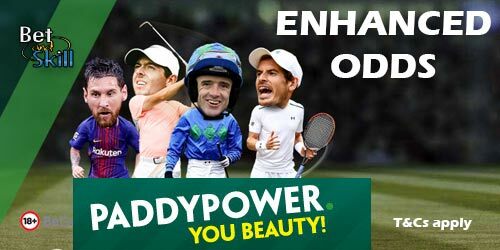 Easy £30 free bets in your pocket! Germany won 8-0 when the two sides met in 2016 and is normally backable at 1/100 to beat San Marino on Saturday! Wanna boost your profits? Claim 3/1 Germany to beat San Marino at Paddy Power! Max bet €/£10! 3. If Germany win the match you will be paid out straight away at the normal price and you'll be topped up with the additional amount in free bets within 48 hours. Place your FIRST BET on Germany to beat San Marino at the enhanced price through Power Play Plus price on site. If your selection wins, you will be paid in cash based on the normal price on site and will have the extra amount, bringing the bet up to the cumulative 3/1 payout, credited in free bets added to your account straight away. This promotion is live until 19:45 on Saturday June 10th and any bets taken after this time do not qualify. "Claim 3/1 Germany to beat San Marino at Paddy Power, instead of 1/100!"